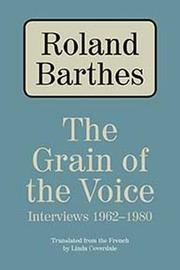 Although the late Roland Barthes says at one point here that he does not like giving interviews, this volume contains 39 of them--and still others, according to an editorial note, may also have taken place. Many of them date from the middle 1970s, when Barthes and his theories attracted popular notice in France; and these tend to be stilted vehicles for the promulgation of Barthes-ian ideas--with interviewer-as-acolyte and Barthes-as-priest. One interviewer asks, for example, "How can this oblique and 'repressive' return of the signified be avoided? How can this emptiness be written without being 'expressed'?" And Barthes answers: "Our present task is twofold. On the one hand, we must somehow conceive. . . how the depth and lightness of the signifier may be expressed contradictorily together. . . ." Elsewhere, too, Barthes feels comfortable enough with his adoring interviewers to make some of his more dubious, oddly naive pronouncements. ("It should be suggested to readers that there are several possible ways of reading, one isn't obliged to read a book in a linear and continuous development. . . . It's amazing: they find nothing wrong with dipping here and there into the Bible, but then they insist that there's no other way to read Guyotat except straight through!") In the later interviews, however, especially in those conducted by the skeptical, bracing, and supple Bernard-Henri Levy, Barthes is shown at his best--leaving behind the doxology of deconstructionism, engaging more in the personal and the human. And, even if much of the material here is near-comically ingrown and jargoned, with interviewers struggling to duplicate Barthes' vocabulary, some readers will find useful, relatively unforbidding introductions to Barthes' ideas--many of which have not worn well--while devout Barthesians will pore over every word.